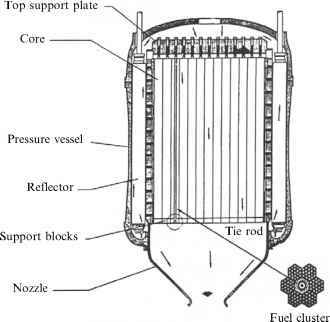 The very first proposals to utilize fusion as a power source for rocket and space propulsion were those by Maslen [Maslen, 1959] and Englert [Englert, 1962]. NASA recognized the potential of fusion at about the same time, see [Schulze and Roth, 1991]. A list of recent studies of generic fusion propulsion concepts is in [Santarius and Logan, 1998], where emphasis is on the power available per unit mass of the reactor, not per unit propellant or fuel mass. This parameter, let us call it a* to distinguish it from the same symbol used in this book, is, in fact, the parameter of importance when engineering a practical reactor. The appeal of fusion propulsion stays in the fact that a* may be in the range of a few kilowatts per kilogram. The starting point in attempting to design conceptually a fusion propulsion system is the choice of fuel fusion cycle. The kinetics of candidate fuels are in Figure 8.8. As for to most chemical reactions, fusion reactions do not start spontaneously, but need to be "ignited" by raising the energy of the reactants (for instance, D and T) so that their temperature is brought above a threshold. The reason is the same of combustion, that is, Coulomb repulsion among like-charged atomic particles. In fusion, the Coulomb repulsion is that among protons of the nuclei one wants to fuse together. In fact, Coulomb repulsion competes with the attraction by the "strong" nuclear force binding nucleons. Since the nuclear force has the shortest range of all three elementary forces, its attraction is felt by nuclei only when they can be "shoved" very close together. This means that much kinetic energy (i.e., temperature) must given or transfered to the reacting light nuclei to overcome Coulomb repulsion. Depending on reactants, threshold temperature triggering fusion among nuclei may be tens to hundreds of million degrees celsius. In eV units this means that reactants such as D, T or other, must be injected inside the fusion chamber at energy 10 to 100 keV. At these temperatures electrons are no longer attached to atoms, and matter is in the plasma state: the mix of positive nuclei and of negative electrons has such high kinetic energy that charge attraction is insufficient to allow them to form again the original neutral atoms. Figure 8.8. Fusion kinetics (T = tritium; D = deuterium; p = proton; n = neutron. Energies are in megaelectronvolts (adapted from [Huba, 2002]).